Frieda says: Colombians celebrate the “Novenas,” nine days before Christmas Eve, families gather together to pray, sing and celebrate the upcoming birth of Jesus. 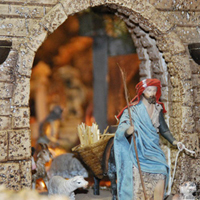 Colombians might even go house to house singing and praying in front of the nativity scenes people create during the Christmas season. 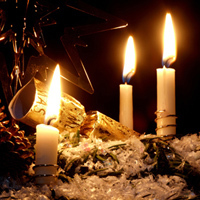 Keith says: “On Christmas Eve churches will have three services, two at an earlier time and one at midnight. One unique highlight at the midnight service is the passing on of the “Peace Light” from Bethlehem. Renée says: “The church highly values the singing of carols interspersed with the Nativity narrative. The Christmas meal is also highly valued including some big chunk of meat – turkey, duck, lamb, ham etc. plus Christmas pudding – quite unique to England. Haven’t been to a church event yet that included Santa Clause, but they do enjoy a good silly mixed up Panto play.